Over the last few weeks, I've been balancing my extensive network of non-paying jobs with a paid job. Not even counting the big job of being a mom to three, which is paid though indirectly, my non-paying jobs include being an involved parent at my kids' school, being a community gardener, and of course, being, the "eat dinner with your family" blogger. This past week was a trifecta of obligations with the school's big fundraiser, the neighborhood greening day, and the usual assortment "can't miss" parent events, like my son's track meet and a parent meetings on "health" (aka need-to-know stuff on puberty, drug use, and other adolescent adventures.) On top was the paid job I took writing a grant for a very important topic that won't be named here (way too depressing). I was very excited to get the opportunity to work freelance in my field (public health policy), and especially happy since it was a time-limited gig (the hard deadline was May 15th). It was interesting work and I hope the grant is ultimately successful, but the most important things I learned were about how I might balance a full-time job with my real life in the future. First, I think my family can handle it. I had to get a lot of extra babysitting (and needed extra housekeeping), but in general, the older kids and even my two-year old adapted very well. My two girls were actually playing "get dressed up to go to a meeting" this morning instead of the usual princessy dress-up. That is a totally new phenom in my house. Second, we still had dinner together every night and there were no major melt-downs from anyone, myself included. True, that might be hard to sustain, but I was glad that we had enough "systems" in place so that this relatively minor schedule change didn't derail us completely. Last, and perhaps most importantly in this forum, I missed blogging on my favorite topics--food, health, and family dinner. 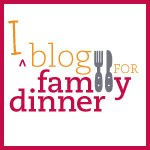 I really enjoy this platform and the process of reading, learning, writing, and advocating for family dinner. I hope my readers enjoy it too. The challenge is sustaining it and moving forward, financially and professionally. But I'm up for it. I think it's worth a shot, so stay posted!